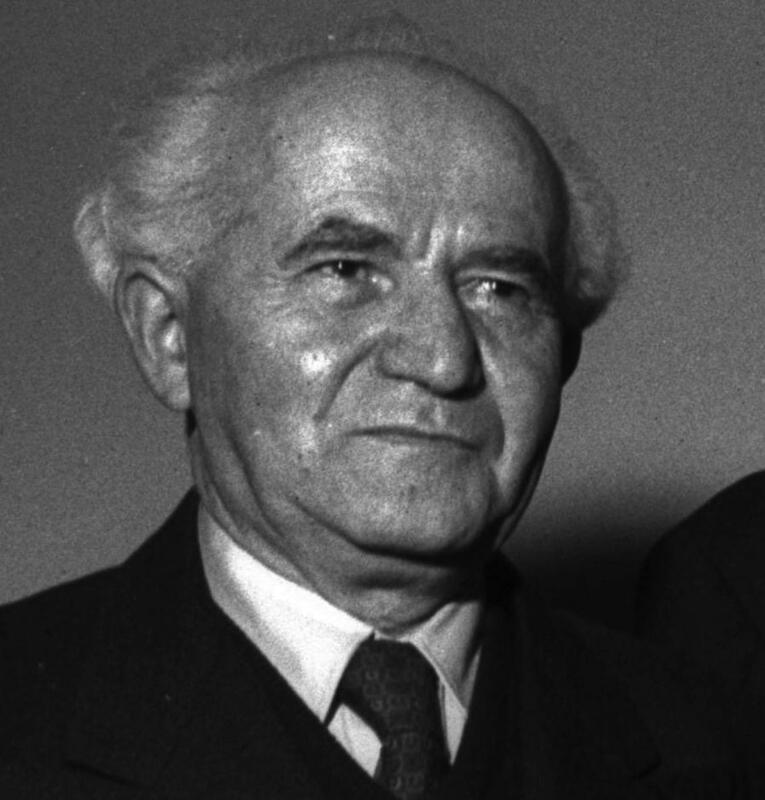 Israel’s first Prime Minister, David Ben-Gurion, posited that Israel could be Jewish, it could be democratic and it could control Greater Israel (all the land between the Jordan River and the Mediterranean Sea), but that it could only choose two out of the three; they were not all possible concurrently. When given the chance in the late 1940s, he readily—if not woefully—sacrificed the third in order to create a state that was both Jewish and democratic. And that state grew and even flourished. In 1967, Israel preemptively struck the armies amassed at its borders and suddenly found itself in control of Greater Israel. But with the land came a lot of new people. Ben-Gurion’s insightful theorem was once again relevant. It’s been just shy of fifty years since the Six Day War, and Israel is still coming to grips with the difficult predicament that Ben-Gurion spelled out so long ago. In 2009, I saw Israeli Ambassador Yoram Ettinger speak about the future of the Jewish State. I had the opportunity to ask him about reports saying that by 2020, Arabs would outnumber Jews between the Jordan and the Mediterranean. He responded by challenging the numbers, claiming that the Palestinian Authority had greatly overestimated the numbers of Palestinians living in the region. It is a position he still holds. I did not have a chance at a follow-up question, but had I, it would have been this: If the Palestinians numbers are as minimal as you claim, why not offer them citizenship? If the Jews of the region significantly outnumbered the Palestinians, Ettinger could bring about his vision of Israel by annexing the Palestinian Territories and simply accepting a bi-national state. Everyone would have an equal vote and with a safe Jewish majority, Israel could finally achieve a Jewish, democratic state that controls all of Greater Israel. Of course, Ettinger’s analysis only works if you reject the actual demographic realities of the region. 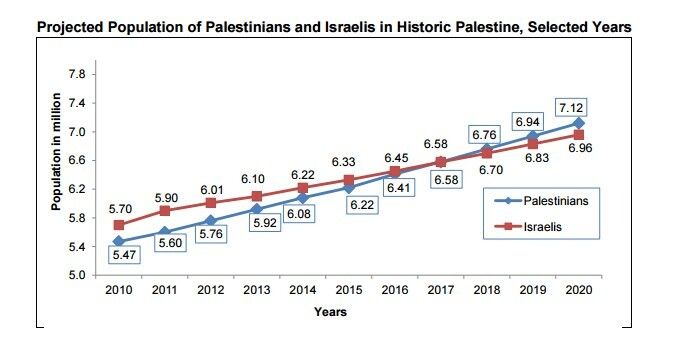 New numbers released this week show that while Palestinians are still on track to be a majority in the region by 2020, they will actually pull even THIS YEAR. Including Palestinian citizens of Israel, as well as those living in Gaza, East Jerusalem and the West Bank, the report projects that by the end of 2017, Palestinians will have parity with the Jewish population at 6.58 million. President Trump will preside over a situation in the Middle East that President Obama and Secretary of State Kerry foresaw but were powerless to act on. President Obama’s abstention at the UN and Secretary Kerry’s recent speech were clearly geared at waking Israel up to a new reality, one that is no longer in waiting but has virtually arrived. This is an old argument, but one that has been very powerful for Israel. For decades, Israel has sought peace, at times through great sacrifice, at other times simply going through the motions. But Israel always had the benefit of time on its side; the demographic make-up of the region meant that Israel enjoyed a Jewish majority. While peace was always sought, it never carried an existential demographic imperative. This may just be the year that changes. President Rivlin was upset with the international community. His threat however was leveled directly at the Palestinians. Even if the PA orchestrated the vote and lobbied for it, they didn’t cast it. Those votes were cast by China, Russia, France, England, Spain, Japan, Ukraine, et al. Responding with threats to the peace process implies that the Palestinians need a negotiated peace agreement while the Israelis can live without it. But everyday that rolls by makes this current evaluation less and less accurate. Today the Palestinians yearn for a state. But in a year, or three, it may well be Israel who is anxious to come to the table to fight for two states while the Palestinians are busy advocating for a one-state solution. A new survey found that two-thirds of Palestinians no longer believe that a two-state solution is possible. If Prime Minister Netanyahu thinks it’s hard to build—and hold—a coalition today, wait until he tries as part of the country’s Jewish minority. As with so many issues, PEOTUS Trump has never made clear his exact goals or plans for this part of the world. Following the UN vote, he tweeted his unwavering support for Israel. Shortly after declaring that he wanted to solve this complicated conflict though, he chose David Friedman as his Ambassador to Israel. Friedman, Trump’s bankruptcy lawyer, supports Israeli annexation of the West Bank. And Friedman is in good company. What was once a fringe concept amongst Israelis is now supported by Israeli Education Minister and MK Naftali Bennett, head of The Jewish Home, amongst others. And without an Obama bogeyman to pick fights with, Bibi will be forced to continue pulling to the right to fend off challenges by Bennett, his one-time ally, and others. Bennett supports annexation of parts of the West Bank and continued settlement expansion. He is open about the fact that he does not support Palestinian statehood. He even met with member’s of Trump’s team, just days after the election, to ask them to explore alternatives to the two-state solution. Assuming Trump doesn’t decide that he knows what is best for Israel, opting to push back hard against settlement expansion, one could assume that the settlement movement has in him the American President they always wanted. And, at least for now, they control the Israeli government. A majority of Israelis still support a two-state solution. But Israel is being backed into a corner by the settler movement, who despite being a minority of the country control a big seat at the table. For many, their end game is unclear. While there are plenty of pro-settler Israelis who support the Bennett model, Netanyahu is still on record supporting a two-state solution. But the path toward that outcome is harder to visualize with every new settlement expansion. The modern Jewish State was born out of radical optimism and a dream: Ben-Gurion and his peers created a state out of nothing more than sweat, grit and brain power. A kindred people came together after thousands of years in the wilderness and they enacted a miracle. They (re)invented a language and created institutions, infrastructure and an economy out of nothing. And they did it not just for the Jews living on the land, but for all the Jews of the world to know that they had a safe haven from persecution. Israel must grapple with the fact that it is not only responsible to its current citizens, but also to all future generations of Jews, globally. No other nation on earth is faced with such a heavy and complicated task. Israel must thrive today, in part so that it can exist tomorrow should the Jews require refuge in an unpredictable world. That was the vision of the early Zionists, and it is one that lives on today. A two-state solution means walking away from holy lands specifically mentioned in the bible. A one-state solution means either accepting a Jewish minority in a bi-national state or a Jewish minority ruling over an Arab majority. Ben-Gurion and Israel’s founding fathers saw these three choices and they made their decision. Short of a radical shift in Israeli or American policy regarding the settlement movement, it would seem that today’s Israel has resoundingly, if accidentally, reversed course. Today’s Jewish State is opting to exist throughout Greater Israel. Now it will simply need to decide between remaining Jewish and remaining democratic.